VICTOR, N.Y., June 28, 2010 — Toptica Photonics has won a €5.2 million (about $6.4 million) contract from the European Southern Observatory (ESO) to develop four continuous-wave, high-power laser guide stars for the ESO's Very Large Telescope (VLT) in Paranal, Chile. Orange laser guide star in operation at the Very Large Telescope VLT of ESO, on the top of mountain Cerro Paranal in Chile. The guide stars, to be developed by Toptica and its Montreal-based partner, MPB Communications, and installed at the telescope in September 2013, will be based on amplified and frequency-doubled diode laser systems. A combination of a novel narrowband Raman fiber amplifier approach at 1178 nm developed by MPBC is converted to 589 nm by resonantly enhanced frequency-doubling technology. Based on Toptica's scientific product series, conversion efficiencies of more than 80 percent have been demonstrated, the company said. The ESO and many other national and international observatories are moving to equip their telescopes with state-of-the-art laser technology within the next few years. 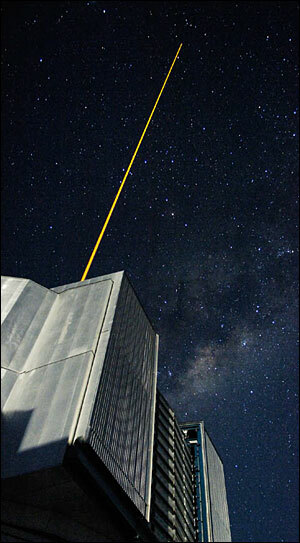 Until now, mainly dye lasers or sum-mixing of solid-state lasers were used to generate powerful CW laser guide stars. This kind of laser, however, is much less efficient and has limited optical output power and extremely demanding maintenance requirements. Over recent years, ESO's laser department developed technology that represented a major breakthrough in the field of fiber Raman lasers and enabled new, compact and ruggedized approaches to the previous problem of high-power lasers at 589 nm. ESO technology licensee Toptica said other visible wavelengths can also be covered with much higher powers, as proved by the latest results. The laser systems being built over the next three years by Toptica and MPBC will include active wavelength stabilization and will be installed directly into the existing telescope structure of the VLT. The 20-W fundamental mode laser sources are designed to provide the backbone of the VLT Adaptive Optics facility for many years to come, Toptica said. Toptica’s 20-W, 589-nm laser guide star system in operation. The system was built in partnership with MPB Communications. The contract is financed in part, by European funds in the framework of the EC FP7 Optical Infrared Coordination Network for Astronomy. A laser using a dye solution as its active medium. Its output is a short pulse of broad spectral content and its achievable gain is high. 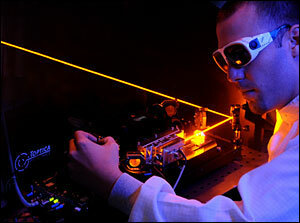 Dye lasers function at room temperature. Synchronous pumping can be used to produce a continuous train of tunable picosecond pulses for sustained periods.